Home / sharing / contests / Mod Floral Blanket: coupon + giveaway! Mod Floral Blanket: coupon + giveaway! It’s been a long time coming, and today I am pleased as punch to announce my new book: Mod Floral Blanket! To celebrate, I’m giving a free copy to one of you, and 50% off coupons to 20 of you! More on that in a minute, but first I need to squeeze into my salesperson hat for just a moment and tell you what is so cool about this book that you’d want to spend your hard-earned pennies on it! I assume if you’ve gotten this far you already think the project is a pretty one, so I don’t have to sell you on that. It’s suitable for advanced beginners, so you don’t need to know too, too much going in. Within a week, I will have a YouTube video available, demonstrating every stitch you need to know for this, so no worries if you are new to crochet. You can use this pattern to make smaller, more instant-gratification items just by varying the number of blocks you use. Heck, crochet one block in cotton yarn and you’ve got a nice coaster! There’s still time to whip this up as a special holiday gift! Those are all of the reasons I can come up with off of the top of my head right now, but there are others I am sure. Take a look at the product page and you will get a clear picture of what you need to know, and what you will learn. There is one free copy up for grabs, and you can win it if you enter below. You can get extra entries by sharing the giveaway with friends, so be sure to take a look at all of the options and give yourself as many chances as possible to win! I’ve set up this coupon code: CROCHETFUN. It will give you 50% off the purchase price of Mod Floral Blanket, if you are one of the first 20 people to use it. After the coupon is redeemed twenty times, it becomes inactive, so if you want the book at this reduced price, you should hurry. If you entered the giveaway, you can still buy the book now. I’ll refund your money if you win. Good luck, and thank you for your support! Yay! looking forward to seeing the book. The blanket is just beautiful! I love the simplicity of the pattern and how the colors pop. I would love to try it as a bag or even a headband in a smaller gauge, but I love the pattern as-is. I really live this blanket. It is beautiful! Lisa, I’m so glad you were able to share this with us. 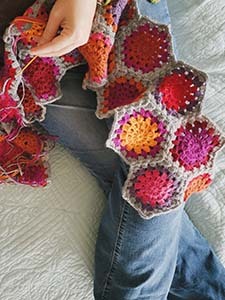 I really love the twist on the vintage Granny Square! Sorry , hit the submit key too quickly. I would try to make it as is, but the colors would depend on my stash. I do like the light background, it really makes the flowers pop. I would make it as is – love the colors and style. Oh, I so want to win this! Ahh! It’s amazing. You did a great job Lisa. Still working on the Lakeside Forest blanket pattern, but I want to try this one too!! Meant to add that I would probably stick to similar colors. Polka Dot Cottage: Now accepting custom orders! Hello GORGEOUS!!! Can’t wait to finish up some projects and work on this next. Thank you so much Lisa! I love the pattern and plan to start it when I finish my daughter’s Doctor Who blanket! Polka Dot Cottage: Crochet basics demonstrated, plus a winner!